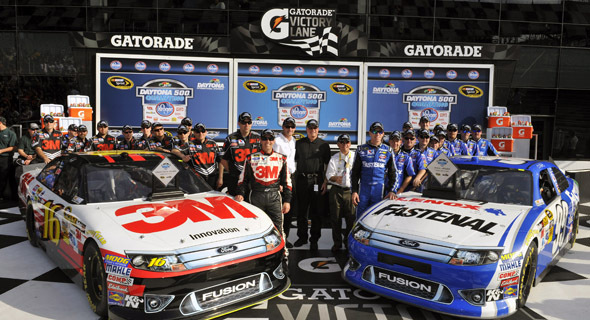 DAYTONA BEACH, Fla. Feb. 22, 2012 – This past Sunday at Daytona International Speedway, Roush Fenway Racing drivers Carl Edwards and Greg Biffle brought lots of attention to the team and to the new Ford Fusion racecar. The Fusion blazed around the track during the pole qualifying run. 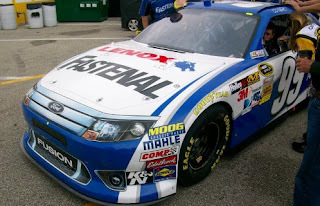 Edwards flew through his first Daytona 500 pole lap in the NASCAR Fusion with a lap speed of 194.738 miles per hour! This was the fastest pole speed for the Daytona 500 since 1999. Biffle cruised in with the second fastest lap time, also sporting the Fusion, with an incredible 194.087 lap speed. The pair of Ford Fusions will be sitting in the front row at the starting line as they wait for the flag to be waved. Edwards and Biffle’s run ended a four-year Chevy pole streak at the Daytona 500. In the unique qualifying procedure for the 500, only the two fastest drivers in time trials lock in positions on the starting grid. The rest of the 43-car field will be filled by the results of Thursday’s twin 150-mile qualifying races, time-trial speeds and provisionals. Winning the pole doesn’t guarantee a win at the big race but it was a positive feat that has the drivers amped up and ready for the first, and most important race of the NASCAR Sprint Cup season. At Brighton Ford, we want to wish Edwards and Biffle good luck at the Daytona 500 this weekend! Drive fast, drive safe, and bring home the “W” for Ford!